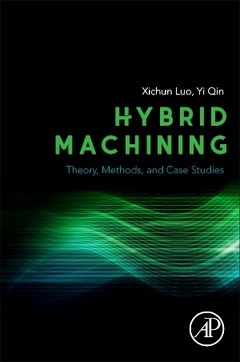 Hybrid Machining: Theory, Methods, and Case Studies covers the scientific fundamentals, techniques, applications and real-world descriptions of emerging hybrid machining technology. This field is advancing rapidly in industrial and academic contexts, creating a great need for the fundamental and technical guidance that this book provides. The book includes discussions of basic concepts, process design principles, standard hybrid machining processes, multi-scale modeling approaches, design, on-machine metrology and work handling systems. Readers interested in manufacturing systems, product design or machining technology will find this one-stop guide to hybrid machining the ideal reference. He previously worked at Cranfield University as a key research officer and delivered world leading research in ultra precision diamond turning and grinding of freeform optics. From 2007 to 2012 he was a lecturer at Heriot-Watt University. From 2012 to 2013 he was a Reader in ultra precision manufacturing at the University of Huddersfield where he lead an Advanced Machining Research Group within the EPSRC Centre for Innovative Manufacturing in Advanced Metrology. He and his research group established an international reputation in ultra precision machining, micromachining and nanomanufacturing research, as evidenced by more than 100 papers in peer-reviewed highly ranked journals and international conferences. He was honored at the Scottish Crucible Awards for Research by Royal Society of Edinburgh in 2010. He won the Institution of Mechanical Engineers 2015 Ludwig Mond Prize for his paper on FIB micro and nano fabrication. He is a Director of the Centre for Micro-Manufacturing, Leader of Knowledge Exchanges of the Department of Design, Manufacture and Engineering Management, at the University of Strathclyde. His main contributions to knowledge in manufacturing, to-date, include new analysis methods for material processing and micro-forming, new forming processes, tool and machine designs, and new manufacturing system concepts. Prof. Qin has published over 170 academic papers/books on various subjects in these fields. He is Editor-in-Chief of the Journal of Manufacturing Review, a Fellow of the Institute of Nanotechnology and Higher Education Academy, Secretary to the Committee of the Consortium of UK University Manufacturing Engineering (COMEH), Member of the European Micro and Nano-Manufacturing Platform. He was a Member of the Scientific Committee of European Scientific Association for Materials Forming from 2006-2012.